Charlemagne hailed from Aachen, where the 1743 Aix-la-Chapelle or Aachen Treaty may have created fireworks that later led to the European Union. Image: wikimedia commons. On November 11, 1993, the European Union was formed, and began to change the course of western alliances and global economics. If there is a source of inspiration for the Eurozone, perhaps it might be Charlemagne who linked Europe through a network of canals and bridges, and then unified the realm through codification of laws and administration. His final achievement was the spread of literacy. Everything Charlemagne did was about connection. Charlemagne, born in 742 AD, became king of the Franks in 768 and proceeded to extend his rule over much of central and western Europe, laying the foundation for what was then called the Holy Roman Empire. 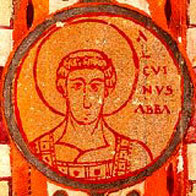 He was crowned emperor of the Romans by Pope Leo III in 800. When Charlemagne died in 814, Europe was so developed that his time of influence became known as the Carolingian Renaissance. Charlemagne was aware of the power and influence that would accrue to whoever connected the Black Sea with the North Sea. He tried to build a canal that would link the two seas via the Main and Danube Rivers. In 793, the Royal Frankish Annals report that the king was advised by certain experts that one could easily travel by ship from the Danube to the Rhine if a canal could be dug between the Rednitz and Altmuhl Rivers, since one of these flowed into the Danube and the other into the Main. Charlemagne immediately took a retinue to the location and began digging. A canal two miles in length and 300 ft wide was built. But incessant rain and soggy ground defeated the engineering. All the earth dug up by day slipped down and settled back into place at night. Later a technical term was developed for this problem: lateral erosion. It’s a problem exacerbated when heavy vessels travel in a narrow channel, pushing sediment up from the bottom onto the banks. The Romans faced a similar challenge building the aqueducts but since these channels were so much narrower, they could effectively shore up the sides with wood and other materials. But Charlemagne’s river canal was too wide, and so the Fossa Carolina, in a region now known as Kaarlsgraben was a failure. In 1845, Louis I built the Ludwig-Danube-Main Canal or Ludwigsanal. Additional construction was completed over the next 100 years. By 1959, the Main-Danube canal was improved, making it navigable for ships over 1,250 tons. The final canal system as of 1992, from the Schiller Institute at schillerinstitute.org. But Charlemagne would be proud that on September 25, 1992, the Rhine and Danube Rivers were finally linked by a 171-kilometer passage formed by the completion of the Main-Danube Canal. The resulting water route is 3,500 kilometers long, and 18 million tons on cargo can be transported while millions of euros in revenues are collected. Another advantage of the canal would have been unimagined by Charlemagne: hydroelectric energy. The Rhein-Main-Donau AG, founded in 1921, has built 57 power stations with a total energy output of 500 megawatts. Revenues will pay back construction loans throughout the license tenure that runs to 2050. A final link will be a total waterway network for Germany under laws launching Project 17, when the Elbe-Havel Canal will link to the Mittelland Canal between Berlin and Hanover, with the center of the project located in Magdeburg, thereby completing the east-west link. Modern day example, Mass Pike. The Massachusetts Turnpike Authority recently changed the rules for tolls between exits 1&2, making this particular passage free. The reasoning? Get locals to use the Pike so they won’t clog up interior roads used by tourists to transit the Pike to Tanglewood, summer home of the Boston Symphony Orchestra. Thousands of music fans might come for a BSO Mozart weekend or a James Taylor concert. These well-heeled folks patronize inns, hotels, and restaurants. Shops cater to generous pockets. Locals meanwhile appreciate the convenience of using the Pike for free. Being of the New England thrifty tradition, many would avoid a toll road when there are interior routes available. But with a special exception, families from Lenox or Stockbridge visit friends in West Stockbridge via the throughway. Bold as he may have been as a military leader, Charlemagne was surprisingly humble, sitting for five years at the feet of his teacher. At the age of 39, on his travels, Charlemagne met a scholar named Alcuin. He asked him to come to the Frankish court to serve as his personal tutor. Charlemagne attacked his studies the same way he waged war – full force. Those in his court who observed him rising at dawn to read Augustine respected him both as a leader and as a student. Later, when Charlemagne decreed all clerics become literate (and provided the training to accomplish this directive), his followers readily agreed because they’d seen the positive influence education had on their leader. So began the monastic and clerical tradition of preserving learning and copying manuscripts that continued during the so-called “Dark Ages” and gave rise to the great universities of Europe and the world. Charlemagne did not restrict his sphere of influence to Europe via conquest but also engaged in diplomacy. In 807, it is reported in the Annals that an ambassador of the Persian king named Abdullah, along with some monks from Jerusalem who were on a diplomatic missions for the patriarch Thomas, came to Charlemagne with gifts from the Persian king: a pavilion with multi-colored canopies, perfumes and balsam, and a most remarkable wonder: a water clock. Charlemagne may have opened channels of communication that remain important today. Concerning tolls, it is our will that those that are fair and have been collected in the past should be exacted from those doing business at bridges, at ferries, and at markets; new or unjust tolls are not to be exacted, in cases where ropes are stretched (across rivers), or when ships pass beneath bridges, and in similar situations in which no assistance is provided to the traveler. Likewise, tolls shall not be exacted from those who have no intention of conducting trade and are carrying their property from one of their residences to another, or to the palace or the army. If there is any occasion for doubt, however, let the matter be brought up at the next assembly that we hold with our officials. An ambassador from the Persian King named Abdullah came to the emperor bearing gifts sent to him by the king. There was a marvelously fashioned clock made out of brass, on which the courses of the twelve hours moved according to a water-clock, with an equal number of little bronze balls, which fell down when the clock struck the hour and caused the cymbal placed under them to ring. In addition, there were twelve mounted figures that issued from windows upon the hour and caused the windows to close again by the force of their movement. – A.D. 807 Capitulary Revised Frankish Annals. Translated by Justin Lake, Harvard University, 2004. In Davidson and Lusk Brooke, Building the World, p. 83. The European Union: In the medieval times, Charlemagne forged connections resulting in shared laws, commerce, and education. Fast forward to 1993 when the European Union, formed by an initial partnership of six countries, was founded. A common currency replaced separate monetary systems. As the European Union invited more nations into its union, financial disparities developed that stressed the economies of the whole; Greece almost went bankrupt and Spain, Portugal and Ireland were on the danger list. What are the advantages – and disadvantages – of a union of countries sharing the same currency but different economic policies? Leaders as Learners: Charlemagne respected advanced learning and was quick to recognize and value its worth. When he was 39 and met Alcuin, he invited him to become his teacher. Charlemagne’s personal study of philosophy proved so valuable to him that he commanded all clerics to become literate and thus began the spread of learning that resulted in today’s great European universities. Similarly, he hosted delegations from Jerusalem as well as Persia whose technologically advanced culture gave to Europe what might be one of the most valued inventions in history: an accurate and intricate clock powered by water. Some historians believe the reason European culture advanced rapidly during the “Carolingian Renaissance” is that the leader himself was a follower – an ardent student. What examples do our current world leaders give to those who look for inspiration? “Annales Regni Francorum 741-829,” edited by F. Kurze. Translations in English from the Royal Frankish Annals. “Einhardi Annales: 793.” Latin text from Monumenta Germaniae Historica. Scriptorum Tomus I. Hannoverae, 1826, p. 179. “A Charter of Charlemagne granting to the Lorsch monastery the rights to fish at Godenowa and to cut wood from the forest, and the authority to construct a roadway and bridge,” Herstal, January, 777, from Monumenta Germaniae Historica. Excerpt. Carolingian Chronicles: Royal Frankish Annals and Nithard’s Histories, translated by Bernhard Walter Scholz with Barbara Rogers. Ann Arbor, MI: University of Michigan Press, 1972. Excerpts. Monumenta Germaniae Historica Inde ab Anno Christi Quingentesimo usqve ad Annum Millesimvm et Quingenesimum, edited by Georgius heinricus Pertz, under the auspices of Societatis Aperiendis Fontibus Rerum Germanicarum Medii Aevi, Hanover: Kraus Reprint Corporation, 1963. L’Europe au Moyen Age: Documents Expliqués, tome 1: 395-888, edited by George Duby. Paris: Librairie Armand Colin. Excerpts. Karl Der Grosse: Levenswerk und Nachleben. Band I. by Helmut Beumann, Bernhard Bischoff, Hermann Schnitzler, Percy Ernst Schramm, and Wolfgang Braunfels. Düsseldorf: Verlag L. Schwann. Excerpts. “Charlemagne’s Canals, Bridges, Castles, and Fleets: 776-811 A.D.” early draft by authors. Charlemagne: Translated Sources, P.D. King, 1987. Excerpts. “Danube Canal,” illustrated brochure of the canal and its history, part of the materials advertising a 14-day cruise on the canal offered as an educational program of the Harvard Alumni Association, 1994. “Alcuin and Charlemagne,” by John H. Lienhard, text of episode Number 797 of series, Engines of Our Ingenuity.http://www.uh.edu/engines/epi797.htm. “The Charlemagne Scholarship,” Rheinisch-Westfälische Technischule Aachen, Aachen University. Internet Ancient History Sourcebook, Paul Halsall, Compiler and Editor. http://www.fordham. Edu/halsall. *“Alcuin and Charlemagne,” by John H. Lienhard, text of episode Number 797 of series, Engines of Our Ingenuity. http://www.uh.edu/engines/epi797.htm.